When I first arrived in Japan many, many moons ago, Halloween wasn't really a thing here. But in the last few years, it's gotten bigger and bigger. This year might be the biggest Halloween yet! That is, until next year. Then, we can have this conversation again. Sure, while Japan still hasn't exactly nailed down trick-or-treating (it's certainly not widespread, but some neighborhoods have highly organized trick-or-treating), the country does have the dressing up part down pat. There are Halloween parades, where loads of people participate. 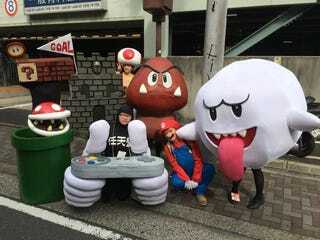 One of the biggest ones, if not the biggest, is the annual Kawasaki Halloween, which was held over the weekend in Kanagawa and drew over 2,500 participants. Have a look at some of the costumes.